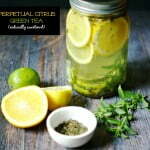 Quench your thirst with this naturally sweetened perpetual citrus green tea over and over again. Make it once and reuse the ingredients up to 4 times with great taste. Add mint, stevia and tea leaves to a large mason jar. Crush the fresh herbs with the handle of a wooden spoon. Add your fruit slices and cover with filtered water. Set in the refrigerator for 1 day. Strain a glassful and drink. Add more filtered water and place back in the refrigerator. Store in the refrigerator for up to 5 days or until the flavor of the ingredients runs out.